ST. PAUL (August, 2015) – Skyline Exhibits began business in 1980 in the Minneapolis/St. Paul suburb of Burnsville, Minnesota. At the time, the company consisted of its founder and a K-car. Today, Skyline is a global leader in the exhibit industry with over 100 dealers, representation in 30 countries and has served well over 100,000 clients. “Our founder had a financial background, but he had a real passion for design and technology,” stated Bill Dierberger, president of Skyline Exhibits. “His drive to innovate is what fueled Skyline’s growth and it remains at the core of who we are today.” Since its inception Skyline has amassed over 100 product and design patents. Skyline has been recognized for its innovation having won several new product awards. 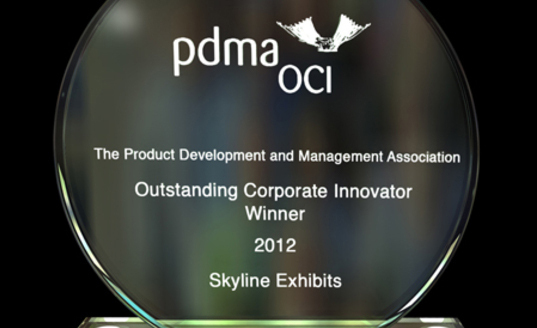 Also, in 2012, Skyline was named a winner of Product Development and Management Association’s (PDMA) Outstanding Corporate Innovator award, a prestigious international award typically reserved for some of the world’s largest, most recognizable brands. Skyline is the only company in the exhibit industry to have received the award. In 2014, Skyline was also recognized for its manufacturing. In its home state, where most of its products are produced, Skyline won Gold for the Minnesota Manufacturer of the Year, Best in Class: Large Company. “We’re proud of what we have done, but our greatest achievement is helping our clients trade and grow their business,” added Dierberger. 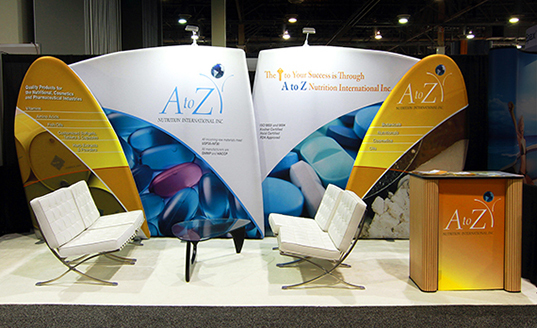 “To generate business at their trade shows or events, clients rely on us to deliver as promised. We are very proud to have achieved ­– and sustained – a 99.6 percent on-time delivery rate.” It is estimated that $6 billion dollars of commerce takes place each year within exhibits that Skyline has designed and produced around the world. Perhaps Skyline’s most innovative system is WindScape, the world’s first air-powered exhibit system which launched in 2013. Clients have already purchased well over 2,000 units ranging from simple backwalls to large-scale custom designs. The magic of WindScape is its ease, lightweight and ultra small packing. A 10-foot unit installs in less than seven minutes with the push of a button and packs in a carry-on case. It has become the fastest selling new product in Skyline’s history.